Custard glass is an opaque glass with colours ranging from pale ivory to bright yellow. 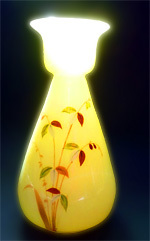 It is opalescent, and usually reacts to black light with a luminous green glow. Most vintage Custard glass produced in the U.S. contains radioactive uranium dioxide. Throughout the centuries, different compounds were added to the glass mix to produce the creamy, custard-like colors. Ancient glass makers added iron compounds. Later, silver, lead, and antimony were used. U.S. glass makers often used uranium salts which were considered a waste by-product of mining, before the effects of radioactivity were well known. It has been found in the tombs of ancient Egyptians. In England in the 1880’s, custard glass was fashionable and was produced by Thomas Webb’s glassworks as hand blown glass, and by Sowerby of Gateshead as pressed glass of exceptional quality. Custard glass was first introduced to the U.S. in the mid-1880’s. Dithridge produced blown custard glass in decorative shapes, and place settings are rare. Northwood Glass Company was the first U.S. glass maker to produce full place settings in pressed Custard glass. Their first line was called Louis XV and was decorated with gold enamel. The glassware was instantly popular and Northwood followed Louis XV with other patterns. Many of their lines had detailed hand painting or gilding. Northwood also made blue custard glass, which was not true custard, but is still highly collectible. 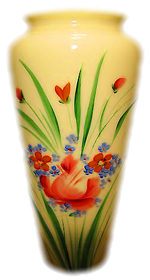 Other glass manufacturers followed Northwood’s lead and created their own lines of Custard glass after 1900. Tarentum, H. Northwood, Jefferson, Dagan/Diamond, Coudersport, Fenton, Cambridge and Mckee were the largest manufacturers. Uranium and sulphur dioxide were common colorants in U.S. pressed Custard glass. Varying the amount of each compound created variations in color, and shades of ivory, pale yellow, and light green were the most common. The glassware was immensely popular in the U.S. until Carnival glass became the new fad. The demand for Custard glass began to dwindle about 1915 and most companies tapered off their production. Today, only Fenton Glass and Boyd are creating Custard glass in small amounts as speciality items for collectors. After WWII, very little Custard glass was manufactured. The military restricted the access to uranium with the creation of the atomic bomb. Strict health regulations regarding the handling of uranium were put into effect. Modern manufacturers have found that other chemicals can create the same creamy colors. The actual amount of uranium in Custard glass is minute, perhaps 1%-2% of the glass mix. Even a large collection of Custard glass poses little hazard, emitting about as much radiation as your TV set or microwave. Enjoy your glass collection; don’t pack it away in a box … Beautiful glass is meant to be used and admired. Take care of your vintage Custard glass by hand washing it only (no dishwashers! ), and never put it in the microwave.